Forcing companies to transfer 10 pct of their equity to employees, as the Labour party proposes, seems a benign form of socialism. But capping dividends limits the benefits of spreading wealth. And handing the surplus to the government means it’s really a disguised tax hike. 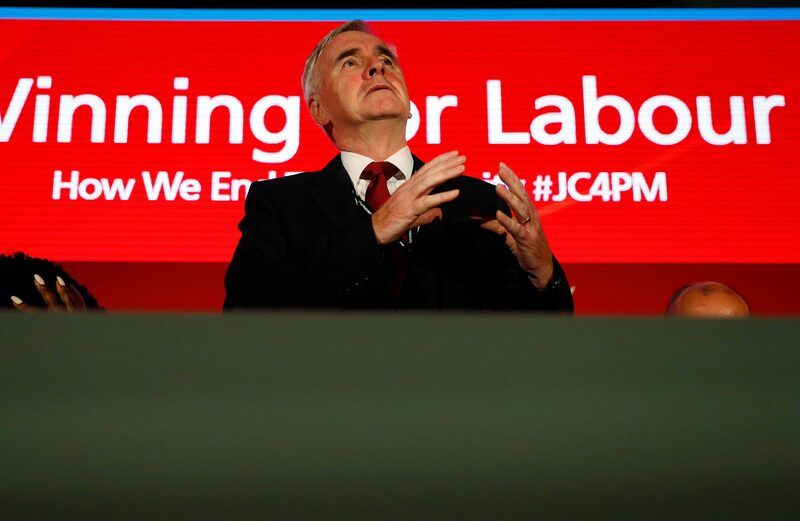 Britain's Labour Party shadow Chancellor of the Exchequer, John McDonnell speaks during a fringe meeting during his party's annual conference, in Liverpool, Britain, September 23, 2018. Large British companies would be forced to transfer as much as 10 percent of their shares into a fund to be owned and managed collectively by their workers, under plans set out by Britain’s opposition Labour party on Sept. 24. Labour finance spokesman John McDonnell is floating a proposal that companies with more than 250 employees would have to create an “Inclusive Ownership Fund”, transferring at least 1 percent of their shares into the fund every year, up to a maximum of 10 percent. “The evidence shows that employee ownership increases a company’s productivity and encourages long-term thinking,” McDonnell will tell Labour’s annual party conference, according to extracts released in advance. Under the plans, individuals’ dividend payments would be capped at 500 pounds a year. The rest would be transferred back into public services in the form of a “social dividend” into the national fund that the plans envisage being worth 2.1 billion pounds by the end of the first term of a Labour government. Labour would require large companies to reserve at least one-third of seats on their boards for workers, party leader Jeremy Corbyn said on Sept. 23.